If you look at our mobile-phone-optimised website on a traditional computer monitor, then you will see the same view as on a widescreen mobile phone. This makes the “baby” website useful not just for mobile phone owners. This upgrade is possibly the last piece to go in the jigsaw of our integrated marketing system. We can use the Internet, direct mailing, adverts in shop windows, and a variety of other methods to promote our firm. 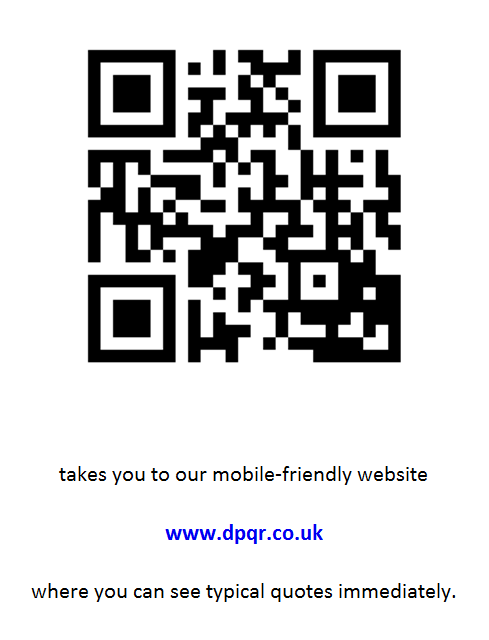 Everything will have a QR code to go to the mobile phone website. That means everything! If we can design a system like this, then you might just want us as your business adviser and not just the bean counter. If you buy goods and sell them on eBay, then you are engaged in a trade and need to register with HM Revenue & Customs and to prepare accounts. You need to do the same if you set up a shop on eBay. If you merely inherit some goods, or are merely clearing out your attic or garage, and you sell them on eBay as a one-off, then there is no trade, but you may need to report a capital gain on substantial items on your annual tax return. We are able to prepare accounts for eBay sellers. We can process eBay Trader CSV files electronically, and we will give you a 25% discount if you supply sales information in CSV format. We are pleased to offer accountancy and tax return services to businesses in Thursby and Cumberland. We have an instant online quotation system where you can type in the details of your business without needing to give your name and address. You can try out different things, and revisit the quotation page as often as you like. This system is unique to us at the time of writing, and we support it with new and advanced technology. We are based in Carlisle and offer a free initial consultation. This is our QR code, which is the entry point for our mobile-friendly website. This is a basic website which gives quotes for mobile phone users. You can also click on the code to see the website on a standard monitor. Value Added Tax returns for the quarter ended 31 July 2015 are due to be submitted by 7 September, and any payment which is due should be made electronically by the same date. Small private companies with a year end of 30 November 2014 and into their second or later year of existence should submit their accounts to Companies House by 31 August 2015 in order to avoid a Late Filing Penalty. We are pleased to offer tax return and accountancy services to businesses in Carlisle. We have an instant online quotation system where you can type in your business details without needing to give your name and address. This system is unique to us at the time of writing, and a first for Carlisle, and we support it with new and advanced technology. We are based in Stanwix and offer a free initial consultation. We are pleased to offer accountancy and tax return services to businesses in Dalston. We have an instant online quotation system where you can type in the details of your business without needing to give your name and address. You can try out different things, and revisit the quotation page as often as you like. This system is unique to us at the time of writing, and we support it with new and advanced technology. We are based in Stanwix and offer a free initial consultation. We are Chartered Certified Accountants and are pleased to offer accountancy and tax return services to businesses in Carlisle. We have an instant online quotation system where you can type in your business details without needing to give your name and address. This system is unique to us at the time of writing, and a first for Carlisle, and we support it with new and advanced technology. We are based in Stanwix and offer a free initial consultation. As Chartered Certified Accountants, we are as much production engineers as accountants, giving you a definite choice of style in the advice we can offer.